Not to be confused with Declaration of Ukrainian Independence, 1941. 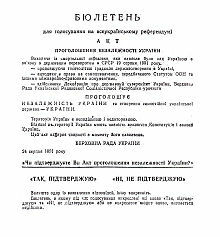 The Act of Declaration of Independence of Ukraine (Ukrainian: Акт проголошення незалежності України, translit. Akt proholoshennya nezalezhnosti Ukrayiny) was adopted by the Ukrainian parliament on 24 August 1991. The Act established Ukraine as an independent state. As printed on the ballot for the national referendum on 1 December 1991. Central State Archive of the higher governing bodies of Ukraine, Kiev. The Act was adopted in the aftermath of the coup attempt on 19 August when hardline Communist leaders of the Soviet Union tried to restore central Communist party control over the USSR. In response (during a tense 11-hour extraordinary session), the Supreme Soviet (parliament) of the Ukrainian SSR in a special Saturday session overwhelmingly approved the Act of Declaration. The Act passed with 321 votes in favor, 2 votes against, and 6 abstentions (out of 360 attendants). The text was largely composed during the night of 23 August–24 August mainly by Levko Lukyanenko, Serhiy Holovatyi, Mykhailo Horyn, Ivan Zayets and Vyacheslav Chornovil. The Communists (CPU), being persuaded behind the scenes by their fellow Party member and parliamentary chairman Leonid Kravchuk, felt there was no choice other than a decision to secede and, as they expressed it, distance themselves from the events in Moscow, particularly the strong anti-Communist movement in the Russian Parliament. "If we don't vote for independence, it will be a disaster," stated first secretary of the CPU Stanislav Hurenko during the debate. CPU members had been unnerved by the news of former First Secretary of the Communist Party of Ukraine Vladimir Ivashko's arrest in Moscow, the re-subordination of the Soviet Army under the leaders of the Russian SFSR and the sealing of the Communist Party Central Committee's premises. The same day (24 August), the parliament called for a referendum on support for the Declaration of Independence. The proposal for calling the national referendum came jointly from opposition leaders Ihor Yukhnovsky and Dmytro Pavlychko. The Parliament also voted for the creation of a national guard of Ukraine and turned jurisdiction over all the armed forces located on Ukrainian territory over to itself. Other than a noisy crowd that had gathered at the Parliament building, the streets of Kiev were quiet that day, with few signs of open celebration. In the days that followed a number of resolutions and decrees were passed: nationalizing all CPU property and handing it over to the Supreme Soviet and local councils; issuing an amnesty for all political prisoners; suspending all CPU activities and freezing CPU assets and bank accounts pending official investigations into possible collaboration with the Moscow coup plotters; setting up a committee of inquiry into official behavior during the coup; and establishing a committee on military matters related to the creation of a Ministry of Defense of Ukraine. On 26 August 1991 the Permanent Representative of the Ukrainian SSR to the United Nations (the Ukrainian SSR was a founding member of the United Nations) Hennadiy Udovenko informed the office of the Secretary General of the United Nations that his permanent mission to this international assembly would officially be designated as representing Ukraine. On 26 August 1991 the executive committee of Kiev also voted to remove all the monuments of Communist heroes from public places, including the Lenin monument on the central October Revolution Square. The large square would be renamed Maidan Nezalezhnosti (Independence Square) as would the central Metro station below it, the executive committee decided. On 28 August 1991 more than 200,000 Lviv and Lviv oblast residents declared their readiness to serve in the national guard. In the independence referendum on 1 December 1991, the people of Ukraine expressed widespread support for the Act of Declaration of Independence, with more than 90% voting in favor, and 82% of the electorate participating. The referendum took place on the same day as Ukraine's first direct presidential election; all six presidential candidates supported independence and campaigned for a "yes" vote. The referendum's passage ended any realistic chance of the Soviet Union staying together even on a limited scale; Ukraine had long been second only to Russia in economic and political power. A week after the election, newly elected president Leonid Kravchuk joined his Russian and Belarusian counterparts in signing the Belavezha Accords, which declared that the Soviet Union had ceased to exist. The Soviet Union officially dissolved on 26 December. Since 1992, the 24th of August is celebrated in Ukraine as Independence Day. Poland and Canada were the first countries to recognize Ukraine's independence, both on 2 December 1991. The same day the President of the Russian SFSR Boris Yeltsin did the same. The United States did so on 25 December 1991. That month the independence of Ukraine was recognized by 68 states, and in 1992 it was recognized by another 64 states. This act becomes effective at the moment of its approval. ^ a b "Activities of the Member States - Ukraine". United Nations. Retrieved 2011-01-17. ^ a b "Ex-Communist Wins in Ukraine; Yeltsin Recognizes Independence". The New York Times. 3 December 1991. Retrieved 20 August 2017. (in Ukrainian) "Great Saturday" – an interview with writer and parliament deputy Stepan Pushyk on the events of August 24, 1991.